When Fiona Dawson left Ireland for the third time in 2001, she found herself telling her friends and family that she would be back within a couple of years and that her venture to the UK would be a short one. Part of her knew she would never return. But going to the UK was a very good decision - Dawson is now global president of Mars, overseeing food, drink, and multi-sales for a $35bn company. 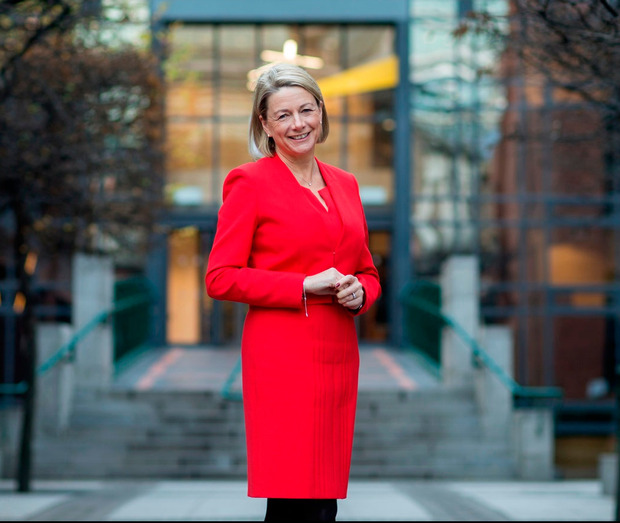 She has remained closely connected to Ireland, where she was recently named Ireland's "ultimate marketer" over the last 25 years by Marketing.ie. "The Ireland that I know and love, the one I was part of when an all-Ireland team beat the All Blacks on home ground, is a country that has come forward so much since I left university," says Dawson. "It constantly astonishes me to see the level of progress that's happening. A lot of people look with great admiration both in the business sense and the political sense when I talk to them about Ireland and how it faced into the last economic crisis. "Ireland took very bold decisions that may not have pleased everyone, but they were decisive and clear and painted a road map that many people admire." Dawson, from Churchtown in south Dublin, returns home every six weeks or so and has noticed that the recovery hasn't quite reached everyone. She believes that the progress that has been made may not have been all that evenly balanced. "I'm very conscious that the Ireland I see is Dublin, and if I lived here I would be encouraging people to think about how we create a more universal economy within Ireland, one that reaches outside of Dublin and extends its wealth and productivity," she says. "I do pass through some towns that have low employment rates, still have a surplus of housing, and think 'Gosh, there's something not quite right here and we need to balance that out'. Ireland isn't just about Dublin, it's about all of Ireland." The Trinity graduate maintains that an inquisitive look at the working week in Ireland could help address numerous problems in terms of the housing crisis and indeed the congestion of the country's transport links. Societal issues in Ireland have always been at the forefront of her family's thinking. Dawson's father, the late Adrian Cronin, was head of RTE's light entertainment arm. Saturdays meant watching others on stage, instructed by Cronin who was revered as a "ground-breaking" director of the The Late Late Show. "It made you very comfortable with media and the art of creativity and really recognising the power of communications," Dawson says. "Those were the days when dad would get death threats coming through on some of the topics they were covering. They were really exploring political, religious, and sexual issues for Ireland, which was unheard of. I was very proud of the work they did and also saw the resistance they came across, which I think did inspire me." During her time at Mars, which employs more than 100,000 people, Dawson has witnessed the company tussle with the media on a number of occasions. One such incident revolved around the company's decision to label its lasagne sauces, oven-bake kits, and pesto as "occasional foods". It was part of a five-year global health initiative by the company whereby it announced that as "some Mars Food products are higher in salt, added sugar or fat", these "products are not intended to be eaten daily". The media naturally pounced on the frank admission from the group with headlines such as: "Dolmio warns customers not to eat their sauces every day". But it was a reading of the situation that Dawson took issue with. "It was much more to highlight that some of our products have higher levels of fats than others and they wouldn't be ones that would surprise you. For instance, a creamy sauce for lasagne is high in fat, and pesto is a bit high in salt. "That was simply it, but it grabs the headlines because we took bold action. It would have been easier for us to put in a lot of artificial sweeteners." Another such story to grab headlines was the fact that Brexit would result in the extinction of the Mars bar within the UK. Numerous stories suggested that England's food secretary Michael Gove was told that supply of Mars bars would run dry within weeks of a no-deal Brexit due to the perishable nature of a number of its ingredients. "It is always very humbling when you see the Mars bar is still one of the great icons and people still use it as currency, the price of a Mars bar," Dawson says. "The fact of the matter is that, although we manufacture in the UK, our supply chain is incredibly complex. We have plans in place to ensure the continuity of supply. I think that headline came out of the sheer complexity of most manufacturer's supply chains and that you cannot simply say let's just produce everything in the UK." In the midst of those contingency plans is a commitment to stockpile resources both in the UK and Ireland. While a lot of Mars' manufacturing is based in the UK, its plans for the worst-case scenario do not involve pulling out of the region, quite the opposite in fact. "The UK doesn't suddenly become an island that you can't get things in and out of," she says. "We would still be able to move products. The things that would be impacted would be things like tariffs, which would have a big impact on costs and will cause inflation in Ireland, the UK and Europe as well. "At the end of the day, proximity in the food and drinks sector trumps a deal." Dawson also dismissed the idea that producing in Ireland could be cheaper than the UK in the event of a no-deal Brexit, despite the introduction of tariffs and border checks. "As a global manufacturer we're very lucky. We deal with volatile inflationary situations around the world. Whether it's looking at Latin America and Brazil at the moment, which is going through a terrible time, South Africa is going through hyper inflation, Russia through boom and bust. "This is not something that's unusual for us, working within difficult tariffs and borders," Dawson says. "Brexit is something we don't take lightly - particularly as the indecision around it causes great uncertainty for people - but I feel, as a multinational, we're very well placed for it." Mars, which also counts the M&Ms, Bounty, Twix, Skittles, Maltesers, Snickers, and Milky Way brands within its stable, is also facing up to the rising tide of healthy eating. "Chocolate is a treat product. We have seen the emergence of healthy eating and it's fantastic to see how aware people are now of their diets and the role of treats within their diets," Dawson says. "We do have classic 'better for you' products in our portfolio. And then we will have treat products and indulgent products as well." Dawson, who spent a brief stint away from Mars at Pepsi, stated that she is prepared to acquire healthy food businesses if needed. When asked if any Irish businesses were potential targets she said she "couldn't possibly comment". She sits on both the board of Mars and indeed the Trinity Business School. Alongside her at the top table of the multinational are members of the elusive Mars family, the third-richest family in the US. The family has been widely labelled as secretive with many pointing to a lack of public interviews. One such assertion Dawson takes issue with. "They're fantastic. Honestly you feel part of the Mars family, the family feel extends throughout all of our 100,000 associates," she says. "I get upset when I hear that word [secretive] used. In fact, they are far from secretive, you can Google and see Stephen Badger has done quite a number of interviews. But they are very humble and they are a company who believe in investing in the long-term good of their business and doing the right thing for the communities and environment that we operate in. "Now if people say that's secretive that's one way of looking at it, but the humility they have is very inspiring." From an early age she began forcing change at her enormous employer. In fact, within weeks of her arrival, Dawson had already spurred an alteration to a company policy. "I think I'm responsible for Mars changing their policy on grads coming into the business because on the application form they asked 'Can you drive' and I said 'I can'. What they didn't ask was 'do you have a licence?' Which I didn't." After a couple of attempts on the streets of Milltown in south Dublin, Dawson was given the green light to start driving. "I started as a merchandiser in Ireland going around by bus, building displays, which is absolutely true. Once I passed my test, I moved the UK." Dawson moved around quite a bit, between Ireland, the UK, the US, and even Brussels throughout her career. A recent acquisition of a food company Tasty Bite means that she also now has an insight into India. Despite all this her "hardest time" was all the way back in 2001, the last time she left Ireland. Dawson seems determined to ensure that she will in fact come back. "I always see myself returning home, this is home. We come back regularly, my kids see themselves as being as much Irish as they are in the UK," she says. What is the one piece of advice you wish you were given when you were starting out? Don’t be worried about everything working out perfectly, sometimes it is during the most seemingly difficult times in which you learn the most. The older I have become the more risks I take, and the more I learn. Where do you believe the food industry will be in 50 years? If only I had a crystal ball. The reason it is called fast moving consumer goods, is because that is exactly what it is — fast-moving. You have to stay on your toes, be consumer-facing, and not afraid of taking risks. You need to keep creating possibilities. You can’t predict the future with certainty, but you can make sure you are ready for it.